Sayar Ticaret was established by Tevfik Sayar in 1952 as a lathe workshop . This workshop manufactured hydraulic lift and machine. In 1980 NEVPA Group of Companies began operations in Nevsehir under administration of NEVPA’s founder director Tevfik Sayar, it was producing truck body accessories and superstructure equipment for trailer and refrigerated box manufacturers. In a very short time NEVPA became a leader of Turkish market without ever compromising on quality production philosophy. Chairman of the Board of Directors Mr. Recep Mesut Sayar took over NEVPA company from Mr. Tevfik Sayar and obtained significant growth of the company every year, he was the best in representing NEVPA company name as a leader of superstructure equipment production in Turkey. 30 years ago NEVPA started production with 10-15 type of products for wooden box manufacturing in its portfolio , today NEVPA is using the latest technologies in production. In recent years NEVPA gives great importance to R & D activities; employing engineers, technicians and technical staff has increased the quality and diversity of the existing product portfolio. 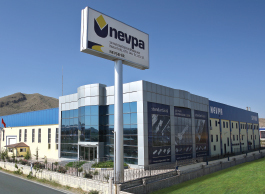 NEVPA bears the honor of being the only company in Turkey who has a professional working mentality on the new product projecting.Being aware of how each of produced parts is important for life and property safety, NEVPA subjects its products to all sorts of safety and quality tests, and keeps all quality and safety certificates needed by the sector. NEVPA offers to the market only those products quality of which is ensured. Become a Global Company by efficient use of resources, being environment-friendly, providing competitive quality with the lowest cost, most sold manufacturing, open to continuous innovations and improvements, meeting the expectations of customers and contributing to the country’s economy. Adopting principles of understanding of the philosophy of total quality management and continuous improvement, be a leader and sample company in its sector who delivers quality goods on time to both the domestic and overseas market, with staff continuously improving themselves and focused on customer satisfaction.